M.Sc. in Medicinal Chemistry is a 2-year full-time postgraduate program in the field of Chemistry. The eligibility of which is passing B.Sc. degree in Medicinal Chemistry with a minimum aggregate percentage of 55% marks and above from a recognized university. Admission to M.Sc. in Medicinal Chemistry program is done on Merit basis. Candidates will be required to pass the entrance examination conducted by few of the reputed colleges and universities. The course covers the important links between biology, disease, and mechanisms of treating diseases using the field of Chemistry. The course is considered to be career oriented providing a range of opportunity after its completion. M.Sc. in Medicinal Chemistry is an integrated field linking together the study of biology and chemistry aiding in studying the important mechanisms related to treating diseases and ailments. The applicants are supposed to have an interest in the dynamic area of chemistry, in the building of drugs, organic synthesis and much more. They should have the trait of critical thinking and analysis along with interpreting the information in hand with an eye for detail. They should also have the capability of handling complex issues, scientific thinking, and a keen mind to observe the changes happening are considered apt for the program. The course fee in average ranges from INR 5,520 to 2 lacs for a span of 2 years. M.Sc. in Medicinal Chemistry postgraduates after the successful completion of their study have an opportunity to be hired in areas of drug design, discovery and development, Metallurgical companies, Pharmaceutical organizations and much more. The average remuneration earned by students after passing the post graduation degree ranges from INR 2 to 4 lacs per annum. Top Recruiting Companies Petrochemical Companies, Metallurgical Companies, Polymer Companies, Pharmaceutical Companies, etc. 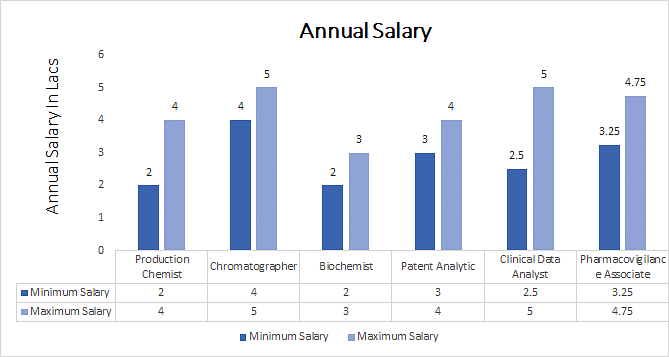 Job Positions Chromatographer, Biochemist, Pharmacovigilance Associate, Patent Analytic, etc. M.Sc. in Medicinal Chemistry: What is it About? Medicinal Chemistry covers the branch of chemistry which deals primarily with the linking of diseases, its mechanisms, development and how they can be modulated or reversed using chemistry of compounds. M.Sc. in Medicinal Chemistry offers candidates a platform for exploring the various dimensions related to this field so as to learn more about the interaction between chemistry and the living organisms. Candidates are skilled in reading the nuances and understanding its application in the field of medicine. M.Sc. in Medicinal Chemistry program covers the dynamic areas of interest which includes knowledge about drug discovery, product chemistry, organic synthesis and much more. They are rendered as a platform to enhance and extend their knowledge and skills in knowing about the applicability of principles and fundamentals related to solving pharmaceutical and medicinal problems. The course benefits in enhancing knowledge about the modern aspects of synthetic chemistry in relation to its significance of the discovery, drug design, and its development. The program helps in building a strong base for all those who wish to pursue M.Phil and Ph.D. in future. The course program is designed in the manner of dividing into a theoretical and practical study. They are made proficient in the understanding of chemistry and its applicability in medicine and other aspects of healthcare. The course includes topics surrounding the study of chemical bonding, chemical kinetics, synthetic organic chemistry, Thermodynamics and other such. M.Sc. in Medicinal Chemistry course also applies other methodologies such as presentations, dissertations preparing candidates for a higher qualification, projects, and lab practice. M.Sc. in Medicinal Chemistry imbibes in students the nuances of the vast subject of chemistry thereby opening a variety of opportunity as research scientists in the field of drugs, pharmaceutics, molecular design, a pharmacologist who synthesize new compounds for preparing future drugs. Eminent organizations both government and private readily hire prospective candidates who have in them the zeal to cross the oceans and get to its depth. The course aims to prepare candidates in overall aspects making them competent in transforming themselves as professional oceanographers who are all ready to recce the oceans as their field of career. Candidates should have completed their B.Sc. in Medicinal Chemistry or equivalent examination with a minimum aggregate of 55% and above from a recognized university. They must qualify the various state and national entrance examinations conducted by the different colleges and universities. Admission to the program of M.Sc. in Medicinal Chemistry is conducted on the basis of the eligibility criteria as deemed by respective universities. This includes qualifying B.Sc. in Medicinal Chemistry or equivalent examination with a minimum aggregate of 55% marks and above from a recognized university. However, the admission criteria are subject to vary for different colleges and institutes. Admission to the course is done on the merit basis, however, certain reputed colleges and universities may conduct their own entrance examination in the process of candidate selection. The overall marks obtained in qualifying examination and entrance tests is thereby calculated to obtain the merit which is subject to differ for various universities. Candidates seeking admission in IIT must pass the JEE entrance examination to qualify for admission to the institute. Candidates can apply for the course both online as well as offline. All information regarding admission dates, counseling and selection of candidates will be notified through email or listed on the official website of the college. M.Sc. in Medicinal Chemistry curriculum propounds candidates to explore the important dimensions of the field thereby making them proficient in the program. They are made familiar to the chemistry of both organic and inorganic compounds, biosynthesis, synthesis, reactivity of chemicals, interactions between living organisms and its chemistry using different tools and techniques. Graduates after the successful completion of M.Sc. in Medicinal Chemistry have a myriad of opportunities in different fields to choose from. They have myriad career prospects in areas surrounding Metallurgic organizations, Plastics, Polymer companies, Medical Research Labs, Petrochemical Companies, Agrochemical Sector, Medical Research Labs, Universities and reputed colleges both in public and private sector. They can choose to become Biochemist, Patent Analytic, Chromatographer, Clinical Data Analyst, Pharmacy Sales Executive, Pharmacovigilance Associate, Relationship Officer, Microbiologist, Quality Control, Production Chemist, Trainee Medical Representative, Pharmacology & Toxicology Research Officer, Area Business Manager, Relationship Officer and much more.